A couple nights ago we visited a popular Christmas attraction in the area which features millions of lights on over a dozen acres. 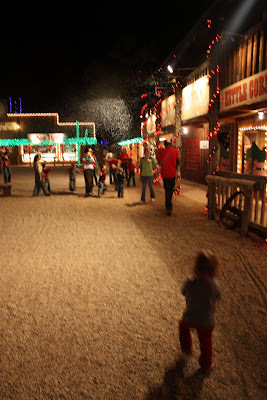 There's a Santa's village with music and games for the kiddos, hay rides, hot chocolate - you name it, they have it. Being in Texas, it also boasts an understated? Texas theme. Understated is probably the wrong word. Hey, it's Texas, you have to go big and be proud. 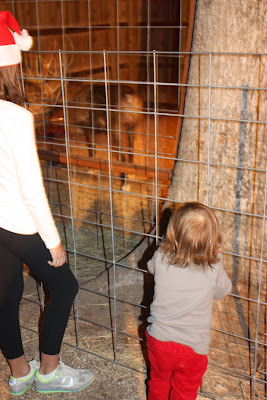 Although K was interested in lights, she was more interested in the hay on the hay ride as she was trying to feed the display animals as we passed by. They even had a snow machine, which she was crazy about. I think she could have played in that the entire time. And of course, it's not a visit to a place like this without meeting with your local country Santa. This year was a lot traumatic compared to last year's easy visit (here). Kathryn was gripping to E. J. as he tried to put her down on Santa's lap. Most of the shots that were taken were of K in complete terror. This one below was from a moment where she had a break and was just in half-terror, so we picked this one out as the official 2011 Santa picture. Santa gave Kathryn some stickers when it was all over and as we were walking away she was saying and waving "bye" and blowing him kisses. Figures. Despite tears after meeting Santa, it was a great night out checking out the lights and spending time together. The short countdown to Christmas is on! Love this time with family. I can't wait to take my daughter to see the lights! Looks like y'all had a blast!